and the Women's Affairs [Technical] Committee"
"The center will focus especially on the history of the struggle of Martyr Dalal Mughrabi and on presenting it to the youth groups." 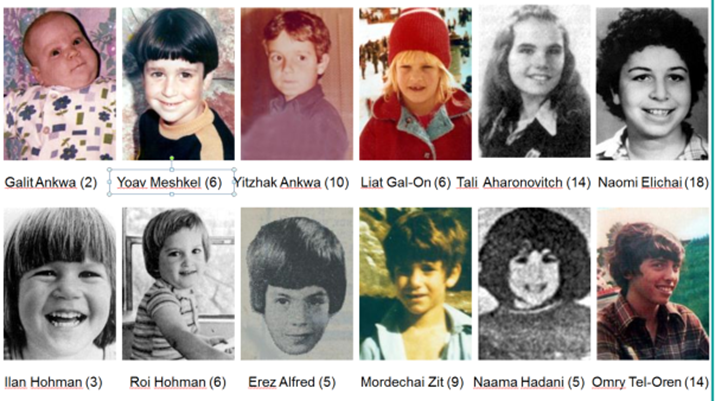 In another show of admiration for terrorist murderers and according to the Palestinian Authority's policy of presenting them as role models for Palestinian youth, the Palestinian NGO "Women's Affairs Technical Committee" (WTAC) has named a youth center for women after the terrorist murderer who led the most lethal attack in Israel's history. "Reem Hajje, a member of the village council, noted that the center will focus especially on the history of the struggle of Martyr Dalal Mughrabi and on presenting it to the youth groups, and that it constitutes the beginning of the launch of enrichment activities regarding the history of the Palestinian struggle." "The Norwegian Representative Office (NRO), along with Norwegian cultural institutions, are among the main cooperation partners in the culture sector in Palestine. The NRO culture program includes supporting cultural rights and increasing the capacity of the culture sector, through civil society organizations that can play the role as agents of change, in cooperation with the Ministry of Culture." It would seem Norway expects the WATC to "play the role as agents of change" - but one wonders which change that might be when the new center teaches youth that a terrorist murderer is a role model for women. UN Women is listed on WATC's website as a "partner," and NGO Monitor has documented that UN Women is a donor of the WATC. Palestinian Media Watch has documented that the PA has turned Mughrabi into a role model for Palestinians. Among other things, it has named 3 schools after her, Abbas has named a computer center after her, and held a birthday celebration for her. Palestinian Media Watch reports have led to debates in the Norwegian government about Norway's funding of the PA and the PA's practice of paying salaries to terrorists. Headline: "The Women's Affairs [Technical] Committee inaugurated a women's center in Burqa"
"The Women's Affairs [Technical] Committee, today, Monday [May 15, 2017], inaugurated the Martyr Dalal Mughrabi Center (i.e., terrorist who led murder of 37, 12 of them children) in the village of Burqa in the Nablus district. Reem Hajje, a member of the village council, noted that the center will focus especially on the history of the struggle of Martyr Dalal Mughrabi and on presenting it to the youth groups, and that it constitutes the beginning of the launch of enrichment activities regarding the history of the Palestinian struggle. The inauguration of the center on the 69th anniversary of the Nakba (i.e., "the catastrophe," Palestinian term for the establishment of the State of Israel) symbolizes the persistence in continuing on the path of struggle and honoring the Palestinian female and male fighters." 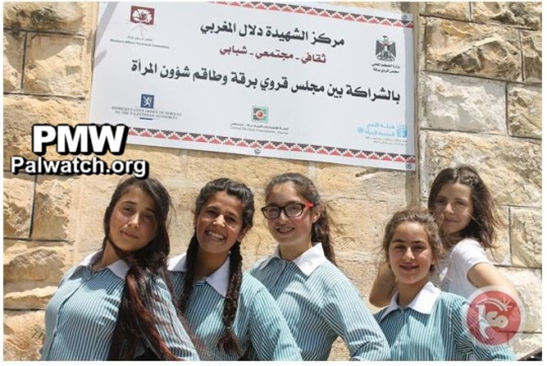 The photo shows girls posing at the Dalal Mughrabi Center below a sign with the logo of the PA Ministry of Local Government (upper right), the logo of the WATC (upper left), the logo of UN Women - a UN organization for women - (lower right), the logo of the Norwegian Representative Office to the PA (lower left) and the logo of the Central Elections Commission - Palestine. In partnership with the Burqa village council and the Committee for Women's Affairs"
Women's Affairs Technical Committee (WATC) - a Palestinian NGO committed to advocate Palestinian women's rights. WATC states on its website that many of its members are also members of the PLO but it does not seem as if the WATC itself is a member of the PLO. The website says WATC "embrace[s] a coalition of seven women's frameworks, represented in the Palestine Liberation Organization (PLO) and a number of women's centers and activists."